Setting off along the track to Loch a Bhracin in perfect weather conditions. In theory and with transport at either end, it would be just feasible to climb all the nine Munro’s in Fannichs in just one day but a few years ago I had planned a week based in Ullapool which included a plan to climb all the Munro’s in the Fannich’s as circular walks over three days but after a week of fairly wet weather with much low cloud I had only managed two of the nine Munro summits and then they were into the cloud. On that week many of my walks were low level. Last May I was now back with NickWild and in much better weather we decided to bag the middle three Munro’s in the group. The other four eastern summits we would climb a few days later, also in very good weather. Like my previous visit, I parked in the same place and today the car park was already almost full. 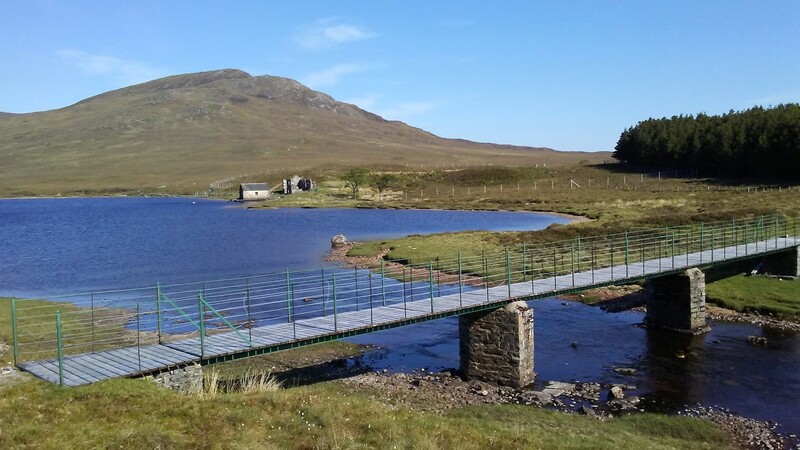 The footbridge at the eastern end of Loch a Bhracin crossed on both outward and return routes. From a high point on the A832 above Loch a’Bhraoin we took the good track down to the loch. Here I discovered that my camera battery was flat but it wasn’t worth going back to the car so I would just have to take poorer quality photographs all day on my mobile phone. The day was already warm as we continued up alongside the upper reaches of the Abhainn Culieig and after awhile we had to cross this stream which was just about shallow enough to cross without removing walking boots. We lost the path further up and took a sketchy path far too close to the stream before realising that the path was well above us. Close to an attractive waterfall we cut up across rough ground to reach the intended path. We now followed this up to a rather windy col where we found some shelter for our morning break. 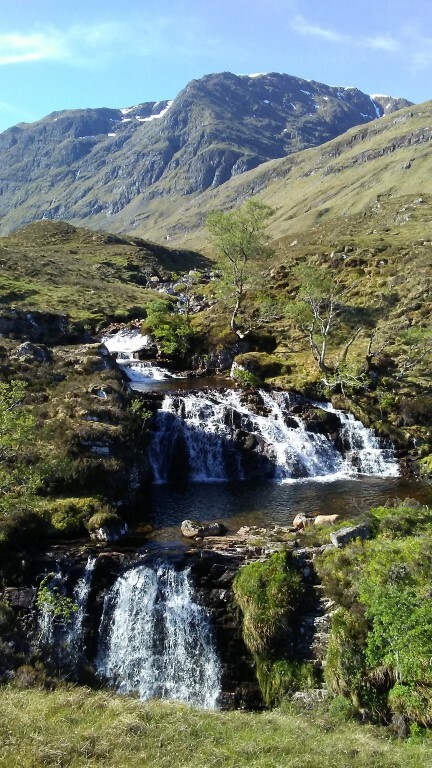 A waterfall on the Allt Breabaig with Sgurr Breac towering above. Most walkers don’t see this waterfall, but at this point we were following a sketchy path below our intended path. Heading generally south southeast we next took the easiest route to the ridge south of Sgurr nan Each, the most southerly Munro in this middle group of three. Another party of three who had followed us up the valley but at a distance took a more direct route to the col at Cadna na Guite but from what we could see, it looked like quite a toil for them. As for us, it was a straightforward ascent to reach the col at Cadha Dearg Mor. To the south lay the shapely Sgurr a’ Chadha Dheirg. Meanwhile we turned north up the easy southern slope of Sgurr nan Each which at 922 metres was our first Munro of the day. We took a leisurely break and the other party of three soon reached the summit. They were doing a very similar walk to us and we would pass one another several times during the day. A morning break on the first Munro at Sgurr nan Each (923 metres) and now joined by another party doing a very similar walk to ours. 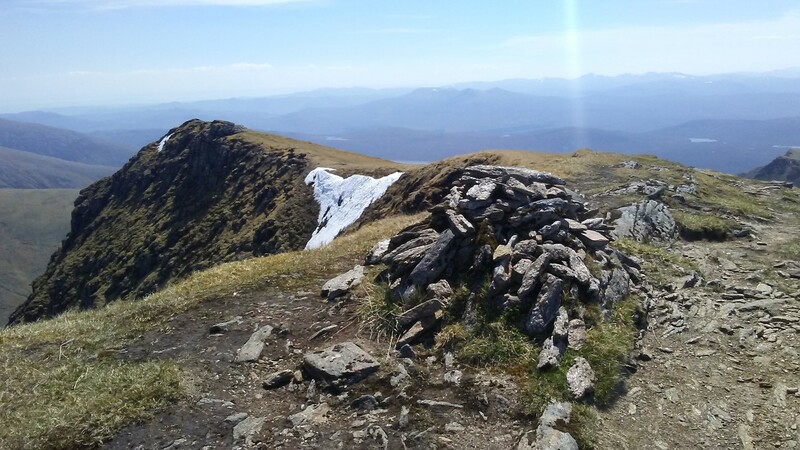 Nick and I set off first and headed north on the curving descent to Cadha na Guite and ahead lay a long ascent of around 280 metres to the summit of Sgurr nan Clach Geala which at 1093 metres is the second highest summit in the Fannich group. A path led up the mountainside and zigzagged most of the way. We took it easy pausing now and again in the warm sunshine. A massive snow block was lying precarious on the craggy slope to the right and was melting so quick that water was running off of it forming a small stream below. Eventually we reached the south eastern spur of the summit which meant an easy walk to the top. The other party were well behind us when we looked back. 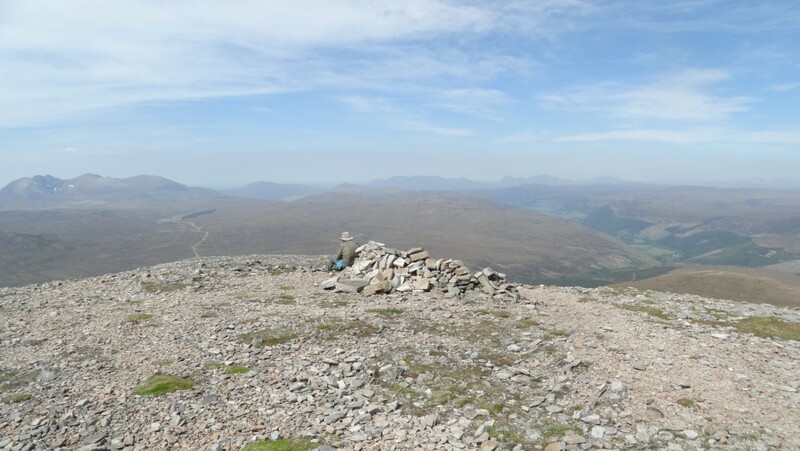 The summit of Sgurr nan Clach Geala which at 1093 metres is the second highest summit in the Fannich group. The summit which was crowned by the remains of a trig point was our lunch stop and we chose a perch facing west on this glorious sunny day. There was no need to rush as we had made good time and the bulk of our walk now would be downhill. Sitting on the summit we couldn’t have chosen a better day. Our lunch time view from the summit of Sgurr nan Clach Geala looking towards An Teallach. We had started out from the right hand side of the woodland block which is visible middle right. Over lunch the other party came by but carried on down the northern eastern slope. We soon followed and caught them up and overtook them as they stopped a long awhile in Coire Breabaig and chatted with another couple of walkers. 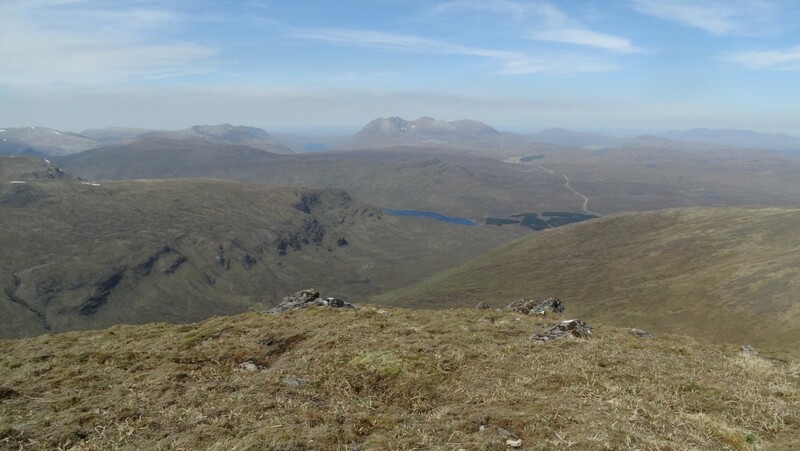 We pressed on across more level terrain before making the easy ascent to Meall a’ Chrasgaidh which at 934 metres was the last of the three Munro’s we were bagging today. 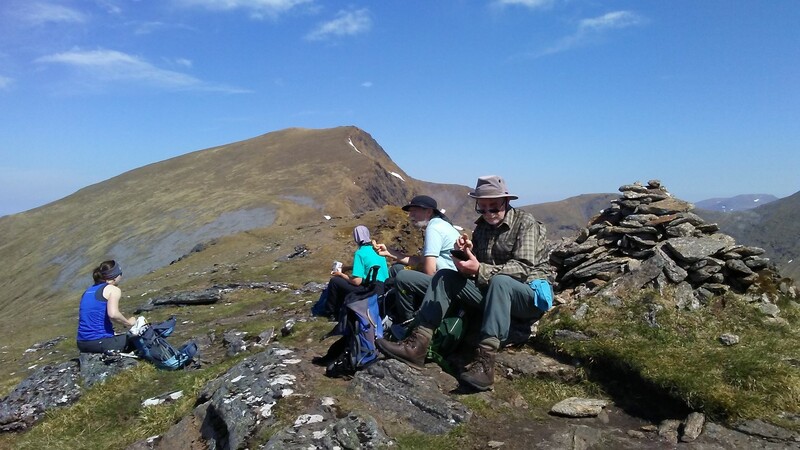 Time for an afternoon break on the summit of our last Munro of the day – Meall a’ Chrasgaidh (934 metres). After another break we decided to head off west descending the very easy slope. It was just like walking over a deep piled carpet and from the top to the path along the valley we managed it in just 38 minutes, – a descent of almost 600 metres. 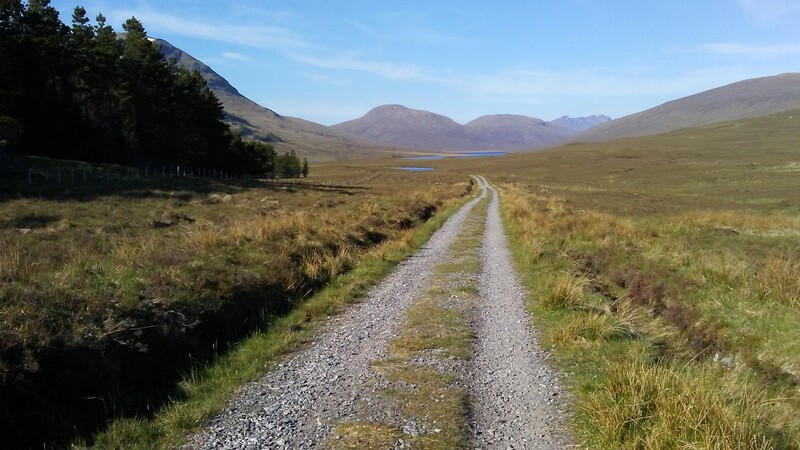 We now followed the correct path back and re-crossing the Abhainn Cuileig at the same point as before. From this point, a good path and later track led back to the car. It wasn’t even 4pm and it had been a day where we had made exceedingly good progress in perfect weather conditions. 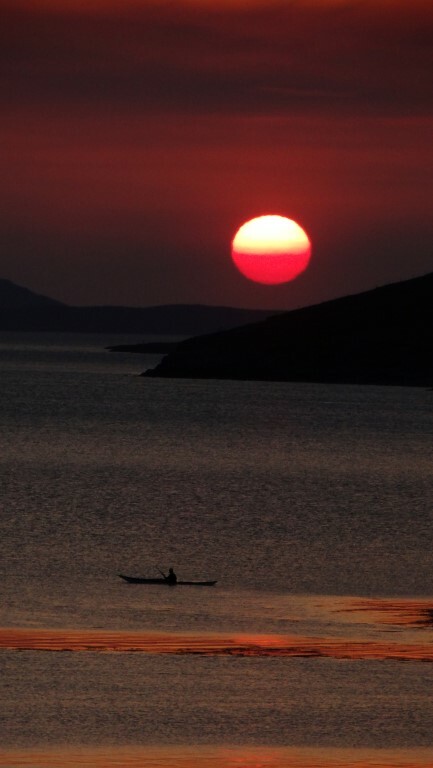 Rounding off a perfect day with this sunset over Loch Broom as views from our self catering establishment at Ullapool.